My intentions for this IWB resource are explained in more detail on the supporting blog for this site teacherledplus.com. It forms part of a series of themed resources to support topics on space. It can, however, be used in isolation as a quick puzzle to challenge thinking skills. The challenge is to connect the coloured chips to each other. Blue to blue, red to red, green to green. The rules state that no cable may cross another cable, nor may they cross another chip, and nor may they leave the pale green bounding box. 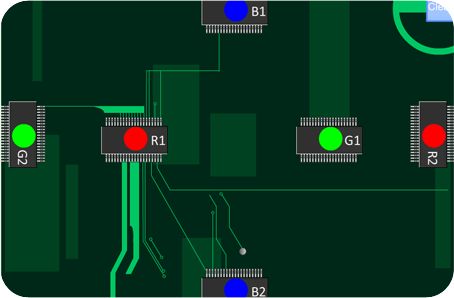 To use simply drag from any of the 1 chips (ie B1, R1 or G1,) to any of the 2 chips (ie B2, R2, or G2). If the connections are made without breaking any of the rules then the resource will indicate a mission success. If a rule is broken the resource will indicate what rule has been broken. This puzzle will at first look impossible to many children but once they attempt it a solution is usually found quite quickly so this resource works well as a starter exercise. Its main goal is to show children that they shouldn’t dismiss a challenge as impossible too quickly. There is a printable sheet to support this resource here which you can hand out to allow the class to try and work it out with pencil and paper. More information on the thinking behind the creation of this resource and how it may be employed as well as links to information on other resources within this topic are to be found here. Go to Mars Circuit IWB resource.